Far too much excitement at C&B Towers and the Overseas Office – EQ8 has arrived!! Not quite in time for our monthly EQ Doodles – you can find November’s offerings over on the Doodle page – but we’ll report back on the many new features of our favourite quilt design program. 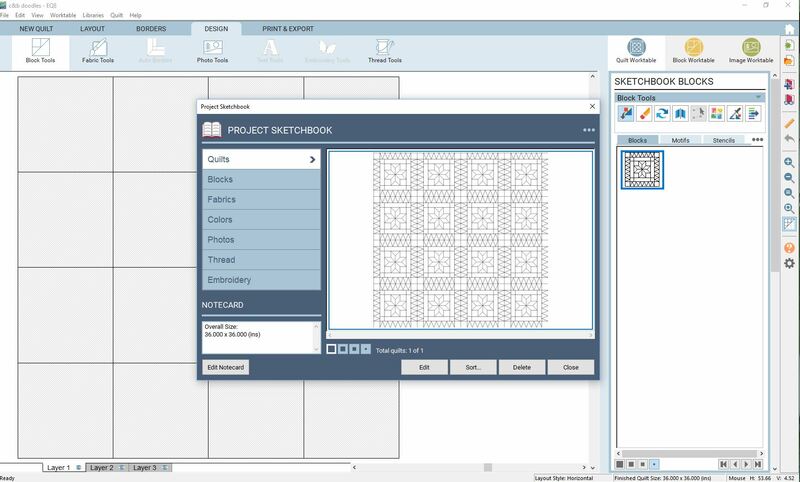 Both of us have used EQ since the very first version and it is difficult to imagine quilting life without it. However – it has arrived in time to do the colouring page which you can download here. Chris has been playing with it in between gardening and teaching and class prep and all sorts of other ‘stuff’. EQ8 is very different in layout from EQ7 – all the buttons and menus are in different places which makes it very confusing. Hopefully over time we’ll get used to it, just as we have with the other versions that have had seemingly drastic changes in layout. C&B Towers continues to hum with activity – Chris is teaching a full programme of weekly classes at The Corner Patch with all the prepping and printing and packing that is involved. Plus there are important landscaping issues to be attended to – a new lake has been added to the park-like grounds surrounding the Towers. Sleep has been in fairly short supply! At the Overseas Office many (smallish) crates of fabric, books and projects have been unloaded and unpacked – sufficient for several months intensive stitching at least. The major problem will be determining where to start – so many projects, so little time!! “We’re celebrating in style…by hosting a Quilt Show with craft stalls (for a little Christmas shopping) on Saturday 18th (10 a.m.-5 p.m.) and Sunday 19th November (11.15 a.m.- 4 p.m.) at the beautiful and historic Holy Trinity Church , Eccleshall ST21 6BY. The Friday morning ladies have made a fantastic quilt to raffle (tickets are available from the shop and will be on sale over the weekend) and the wonderful John Scott from Sewing Quarter is coming on Sunday to draw the winning ticket. All money raised will be divided between Holy Trinity Church and The Autistic Society. Hope to see you there! This entry was posted in Electric Quilt by Barbara. Bookmark the permalink. Mmmmm not sure about EQ8 as still getting used to EQ7. Visiting the overseas office soon so perhaps a demo might be possible? !